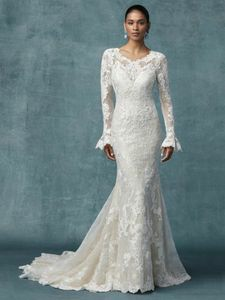 Description: This sheath sleeved wedding gown features cascades of lace motifs over textured tulle, with sheer lace comprising the long sleeves, bell cuffs, jewel neckline, and keyhole back. Lined with shapewear for a figure-flattering fit. Finished with covered buttons over zipper closure.